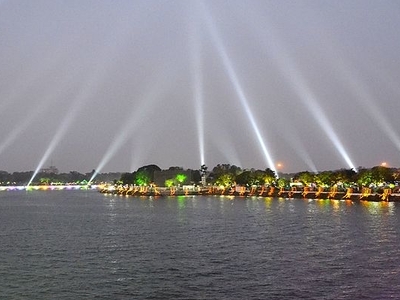 Kankaria Lake is one of the biggest lakes in Ahmedabad. A lakefront was developed around it which has many public attractions like zoo, toy train, kids city, tethered balloon ride, water rides and water park, food stalls and entertainment facilities. Kankaria Carnival is a week long festival being held here in last week of December. Many cultural, art and social activities are organised during carnival. It is located in the southern part of the city, in Maninagar area. Kankaria Zoo, Kamla Nehru Zoological Park was established by Rueben David in 1951 CE spread over 21 acres. It was rated the best zoo in Asia in 1974. They are 450 mammals, 2,000 birds, 140 reptiles in a 31 acre zoo. It is a treasure of wild animals like tigers, lions, python, anaconda, snakes, elephant, albinos (white), like the rhesus monkey and peacock, spotted deer, white blackbuck, chinkara, elephants, emu, jungle babbler, bush-quail and common palm civet. Kankaria Zoo has also records in breeding of rare species in Zoo like pythons, crocodiles, bearcats and wild asses. Reuben David was awarded Padma Shri in 1974 for it. Balvatika, It is a children's park named after Jawaharlal Nehru. Balvatika has a boat house, playroom, butterfly and weapon displays, mirror house, toy house and planetarium. Kids City, Kids City is a miniature World designed for kids. It is spread in 4240 sq.metre area having 18 activity centres including banks, fire station, science lab, radio station, police station, court room and prison, dental as well as medical hospital, theatre, BRTS, heritage gallery, town governance, IT centre, News room, ice-cream factory, etc. AMC had applied for copyrights and patents on the individual games in the premises, the unique point system, Virmo (Virtual Money) and the design of the different venues in games. Balloon Safari, Ahmedabad Eye is a tethered balloon ride set up near Kankaria Lake after renovation. The tethered balloon complex spread over 3000 square yard, is divided into four sections including a restaurant, tethered balloon, heritage exhibit and an exhibition displaying the making of the Ahmedabad Eye. SKYZ is a balloon themed restaurant located at the Ahmedabad Eye complex. It is managed by Ahmedabad Municipal Corporation. Rainforest theme restaurant is also there. Nagina Wadi, There is an island in center of Kankaria Lake which houses a small summer palace and a musical fountain. Food stalls are also there. Stone Mural Park, India's biggest Stone Mural Park named Gurjar Gaurav Gatha on the side walls of the circular lake in which sculptors are depicting, in pink sand stone, the history and rise of Gujarat is under construction. It has murals covering 3150 sq feet depicting the history of Ahmedabad right now but when completed, it will measure 6000 feet in length and will be world's largest mural (30000 sq.metre). Dutch Tombs - The Dutch and Armenian tombs are on One Tree Hill embankment which shows strong trade presence of Dutch East India Company in city during 17th and 18th century. Joyrides - Segways will be introduced soon for people for easy movement around lake. A mini golf course; Aqua Kart and other water sports; Vertical Swing, Paint Ball Shooting, Black Flash and Maverick rides, Sky Fly and other joyrides will also come up. 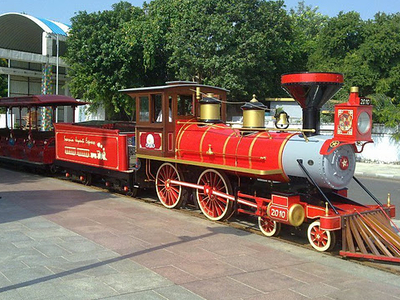 Other, Other attractions include historical Dadu Dayal temple, Natural History Museum, desert safari, aquarium, gardens like One Tree Hill garden, football ground, water sports and rides, open air theatre, Jaldhara water park, boating and small amusement park. It is a good place for yoga, walking, and running, especially early morning. There is also a gym on campus known as Ambubhai Purani Vyayamshala. 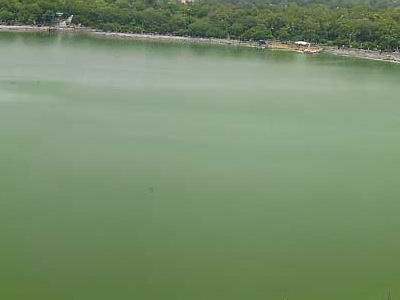 Here's the our members favorite photos of "Lakes in Ahmedabad". Upload your photo of Kankaria! Get in touch with 2 Touristlink members who want to visit Kankaria or with Solanki Vijaykumar, Maneeskumar and 1 others who already have been here.